As the Irish Cancer Society launches its 2015 breast cancer campaign, Paint it Pink, in County Offaly it is delighted to showcase a significant research study that brings fresh hope to breast cancer patients with a particularly aggressive form of the disease, who are resistant to current therapies. Research carried out by Irish Cancer Society Research Scholar, Naomi Elster, is bringing hope to patients with HER2-positive breast cancer, an often more aggressive form of the disease. Ms Elster tested the efficacy of a new type of cancer drug, copanlisib, developed by pharmaceutical company, Bayer. Through this research, she found that the drug acts as a signal blocker in cancer cells and holds promise of stemming the growth and spread of cancer cells when used in combination with standard therapies. This discovery is now paving the way for this drug to be tested in advanced HER2 breast cancer patients when a clinical trial gets underway in Ireland later this year. It will be the first time that this promising new treatment combination will be made available to treatment-resistant breast cancer patients in Ireland. The commencement of this new clinical trial comes as the Irish Cancer Society launches its breast cancer campaign, Paint it Pink. 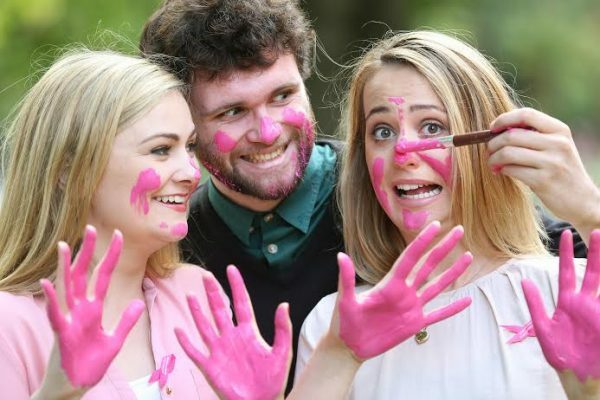 The campaign is calling on men and women throughout Ireland to come together in the fight against breast cancer by holding a Paint it Pink fundraiser this October. The campaign raises money for the Society’s work across breast cancer including the funding of vital research. The Society is calling on everyone in County Offaly to hold a Paint it Pink event, big or small, this October, and help support lifesaving work like Naomi’s research. Irish Cancer Society, Chief Executive Officer, John McCormack said: “We are delighted to see that our commitment to cancer research is and will continue to make a real difference. The positive results of this study, which is paving the way for this new treatment to be trialled for the first time in Ireland, clearly demonstrates the importance of funding research as we launch our new breast cancer campaign, Paint it Pink. Visit www.paintitpink.ie for more information on how to get involved. The Paint it Pink campaign is kindly supported by Ireland’s largest convenience retailer Centra.